LED solar powered PIR motion sensor wall light, a great outdoor light for your yard, path, garden, etc. It will automatically activates lighting when movement is detected in dark spaces, improving safety. Brighter & Wider Lighting: equipped with 40pcs high quality LEDs, increasing the angle and area of illumination. 6W low power consumption. 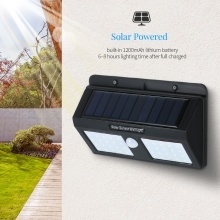 Solar Powered: it absorbs and converts sunlight into electricity and stores in the 1200mAh lithium battery, providing 6~8 hours lighting time after full charge. Dual Sensors: PIR motion sensor and light sensor to detect light brightness and human motion automatically. Sensing range of 3 meters with a 120 degree sensing angle. Automatic Lighting: one key to turn on. In the dark, it will automatically activates lighting when movement is detected and automatically turn off if motion is not detected for over 20 seconds. Weather Resistance: IP65 waterproof, suitable for most kinds of weathers, perfect for using on front door, back yard, garage, driveway, deck, pathway, porch, etc. Easy Installation: wireless style, comes with screws, plastic inserts and double-sided adhesive tapes, easy to install on the wall, fence, ceiling, etc.